As Hurricane Matthew threatened South Florida last October, Citizens Property Insurance Corp. sought to reassure policyholders that all was well. 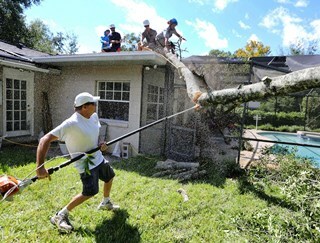 Months later, Citizens revealed it was not ready to respond to a major storm in Florida. Companies Citizens had hired to provide independent claims adjusters for post-storm damage assessments supplied far fewer adjusters than Citizens requested. The problems discovered after Matthew raise questions about whether Citizens will be prepared when the next major storm threatens. Citizens has developed a strategy that would allow it to better respond, but hurricane season is already under way and Citizens’ plan is not scheduled to take effect until Aug. 1. That leaves open the question as to whether the company can handle the effect of a major storm between now and then. If a storm does strike the state, Citizens can only hope to draw enough adjusters from four firms that remain active under an existing 2015 contract. Contracts with the four companies responsible for the 2016 adjuster shortfall have been terminated. Citizens proposes to create a new pool of adjusters. An arborist uses a pole saw on a fallen tree at a Maitland home affected by Hurricane Matthew last year. According to the state Department of Financial Services’ database, 11,948 independent adjusters are certified in Florida to work for insurance companies, down from 29,022 in 2011. All property insurance companies rely on the ability to summon independent adjusters after catastrophes or when hurricanes loom, says Peter J. Crosa, president of the National Association of Independent Insurance Adjusters and owner of St. Petersburg-based Peter J. Crosa & Co.
That’s because in normal times, companies don’t need to directly employ large numbers of adjusters. But when a major hurricane comes, everyone competes for the same pool of certified adjusters, Crosa says. Last October, when Hurricane Matthew threatened to make landfall near West Palm Beach, Citizens estimated the storm would generate 75,000 claims. Citizens asked four claims adjuster management firms to deploy 624 adjusters, Adams told the Board of Governors last year. The firms committed just 279 adjusters, forcing Citizens — which employs only 64 year-round, full-time adjusters — to revise its preparations and hope for the best. Matthew veered north and hit areas with fewer Citizens customers. Just 3,500 Citizens claims came in statewide. Adams told Citizens governors that the company dodged a bullet. If 75,000 claims had been filed, “we would have certainly failed as a claims operation,” he said. About 320 adjusters normally work for Citizens on a day-to-day basis, in the field and in Citizens offices, and they would be among the first shifted to storm duties, according to the new plan.